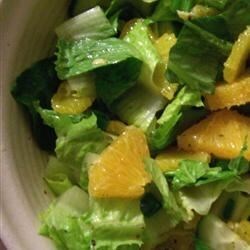 "Romaine lettuce and orange slices are tossed with a light honey vinaigrette." In a small container with a tight-fitting lid, combine the vinegar, oil, honey, salt, pepper and green onion. Close the lid, and shake vigorously to blend. Place the romaine lettuce into a large serving bowl. Sprinkle with dressing and toss to coat. Add orange slices and toss gently. Serve immediately. Watch Chef John grill lettuce. It’s delicious and ready in a flash! I have been making a similar salad for years and will suggest that you might like to add some toasted Walnuts or toasted slivered Almonds (for crunch). This is an EXCELLENT salad! Jeanne A.
I liked this, but the dressing needed more OJ than called for for my taste. Delicious! I didn't use the oranges or green onion. Instead I tossed it with dried cranberries, almonds and feta. This was quick, easy, and delicious! My husband and I both enjoyed this salad. I followed the recipe. It is very easy to make. I did substitute a can of mandarin oranges for the fresh orange. This was a very refreshing salad. The only alteration I made was reducing the amount of oil to a half cup - swimsuit season is coming soon! It was still delightful. Thanks! A great dish for kids! I used white wine vinegar, virgin olive oil and a teaspoon honey (plenty). My kids also added fresh shredded parmesan (which they add to everything). It was great!